Abby the Librarian: AudioSynced: Whatcha listening to? The book blogosphere has many memes. Every Friday we celebrate poetry with Poetry Friday. On Mondays we post about nonfiction for Nonfiction Monday. People may participate in In My Mailbox or the Sunday Salon. There's also Waiting on Wednesday, Booking Through Thursday, Library Loot, and, I'm sure, a whole host of others. Well, Kelly of Stacked and I are adding one more to the mix: AudioSynced. 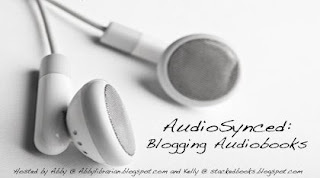 On the first day of every month, Kelly or I will host a roundup of blogosphere posts about audiobooks. We want to encourage people to listen to audiobooks and to post about them. We want to provide a place for people to find out about great audiobooks. So plug in those headphones, check out an awesome audiobook, write up a post about it, and on March 1 head over to Stacked and leave your link in the comments. I love to listen to audiobooks in the car, but if you've got a short commute, listen to audiobooks while you're cooking or cleaning your house or when you go on a road trip. Or see if your local library has picture book readalong kits which will offer you some shorter choices perfect for when you don't spend much time in the car. As an audiobook convert, I can tell you that the more you listen to audiobooks, the more you'll want to listen to audiobooks. And check out Kelly's post on evaluating audiobooks to see what you might be listening for when you review them. While you're at it, you may want to join the 100+ bloggers participating in the 2010 Audiobook Challenge hosted by Royal Reviews. So, go forth and listen. Blog about audiobooks. And on March 1, head over to Stacked where you can grab the image and add your link to the roundup. On April 1, AudioSynced will be here at Abby (the) Librarian, on May 1 it will be at Stacked, and so on and so forth. Questions? Leave 'em in the comments! And hey, spread the word, please. This monthly blogger event has the potential to be a really valuable resource, but only if we can get the word out and convince y'all to participate! What a wonderful idea! I love audiobooks. Time to head off to the library and find some new audiobooks. You know, I don't think I have listened to an audiobook since I was little! I may have to get involved in this and give it a try! This is a great idea. Audiobooks seem to be underrepresented in the book blog world, so this meme will be a nice addition! One of the things I miss most about my old job is that I could listen to audiobooks on my commute. Now I live four blocks away from my library! I think I might start listening to them while I make dinner instead of having the tv on. I am excited to hear everyone's recommendations! Oh, what an awesome idea! I find it hard to get reviews of audiobooks - I don't subscribe to an audiobook journal, and regular book review journals seem to review so few. I definitely agree that audiobooks are also under-represented in the kidlit blogging world. Thanks for the brilliant idea. This is so exciting! I really like reading about what other people are listening to, so I can get more ideas. It's hard to find GREAT audiobooks, so tips are welcomed. Awesome idea! An absolutely BRILLIANT idea - I shall tweet it right away! This is a great meme, I just added it to my calendar so that I can submit audio book reviews as I do them. I'm looking forward to seeing what others recommend.